Clarisonic Set. Perfume Set. Hair Dryer. Cheek Palette. Lip Set. Sunglasses. Tassel Earrings. Trinity Ring. Suede Trench Coat. 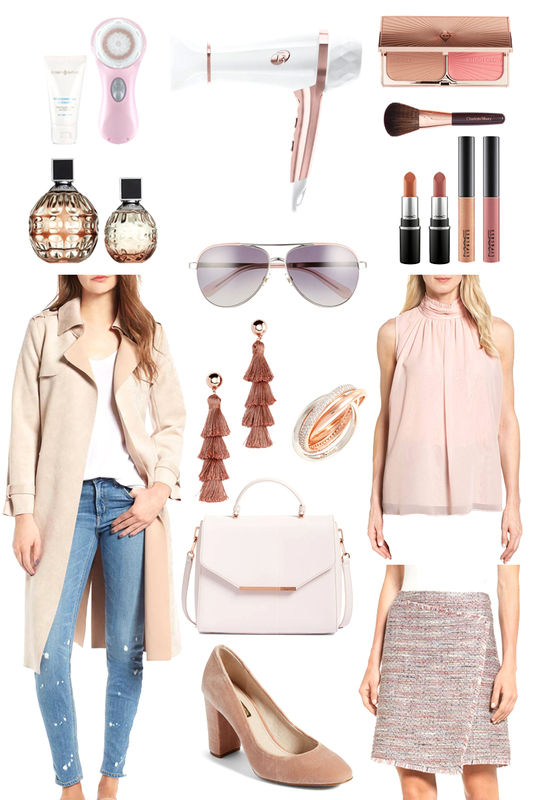 Blush Handbag. Blush Velvet Heels. Silk Top. Tweed Skirt. Happy Nordstrom Anniversary Sale! As of today, Early Access (for those with Nordstrom credit cards) ends and the sale opens to everyone. You can read all about the Nordstrom Anniversary Sale in this blog post, which also includes a curated collection of my favorites including men’s, home, and beauty too. But in a nutshell, the reason why this sale is so popular is because it’s the only sale to offer new fall items at discounted prices. It’s just more exciting to purchase next season’s new items rather than wait for the prices to drop on whatever is left at the end of the season. Everyone uses this sale a bit differently. Personally, I utilize it to stock up on fall basics like sweaters, jackets, jeans, and booties. And I even do a little early holiday shopping. You can see all those items in my first Anniversary Sale post. But for this post, I wanted to showcase some sale items that are a bit more dressy… Perfect for work or date night. I think all the neutral-blush colored beauty products are so wearable and great for everyday makeup looks or for gifting someone. My favorite hair dryer that cuts my drying time in half and makes my hair more shiny. And even a little blush tweed skirt. Happy shopping! And may the bargains be with you! Love your choices! Great post!